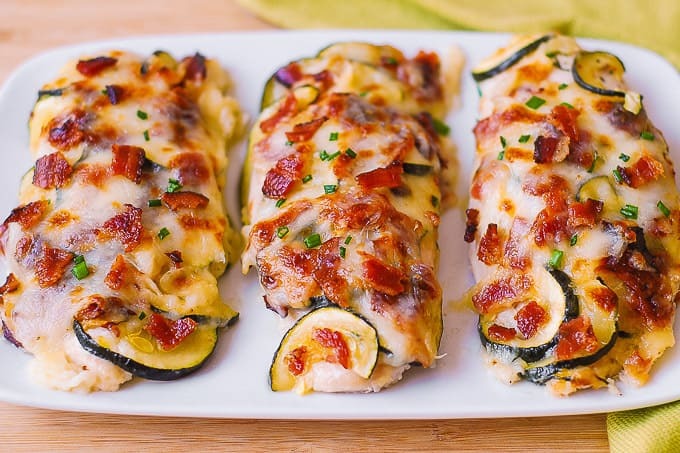 Baked Chicken Zucchini with Bacon is a low carb dinner packed with protein and veggies! Chicken breasts are smothered with Mozzarella and Parmesan cheeses. Everything is baked in a casserole dish. This easy and quick family-friendly meal is gluten-free and KETO friendly. Chicken and zucchini make the best combination! Take a look at family favorite chicken zucchini pasta. 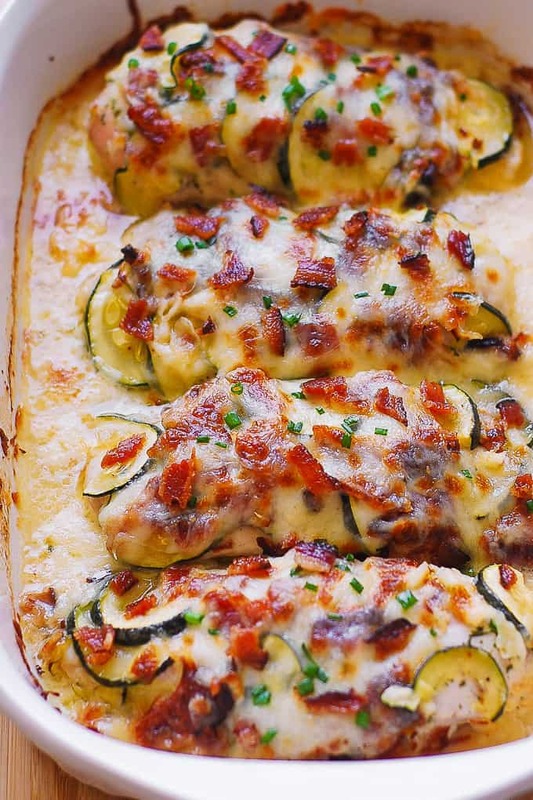 This baked chicken and zucchini with Parmesan & Mozzarella is made in a casserole dish. It’s a delicious one-pan meal with only one dish to clean! The chicken is seasoned with dry Ranch seasoning mix. The chicken breasts are moist and tender. They are baked with lots of Parmesan and Mozzarella cheese in a casserole dish. This is a great recipe if you’re looking to incorporate more veggies into your recipes. Chicken adds a good amount of protein to your dinner. Zucchini is low in calories and a good source of dietary fiber. 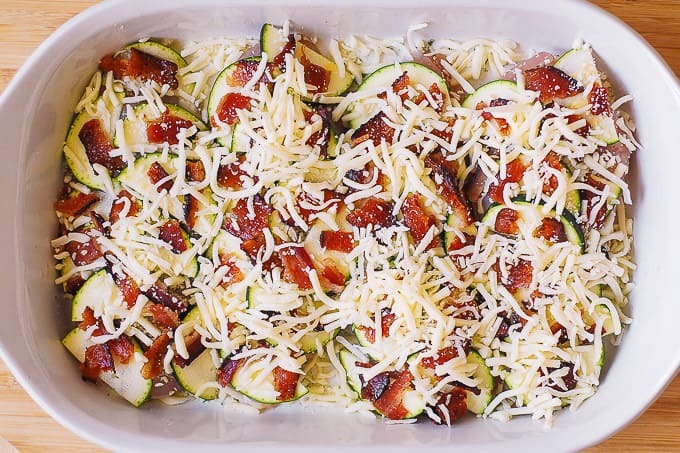 All the ingredients used in this recipe have a low-carb count: chicken, zucchini, bacon, Parmesan, Mozzarella, bacon. 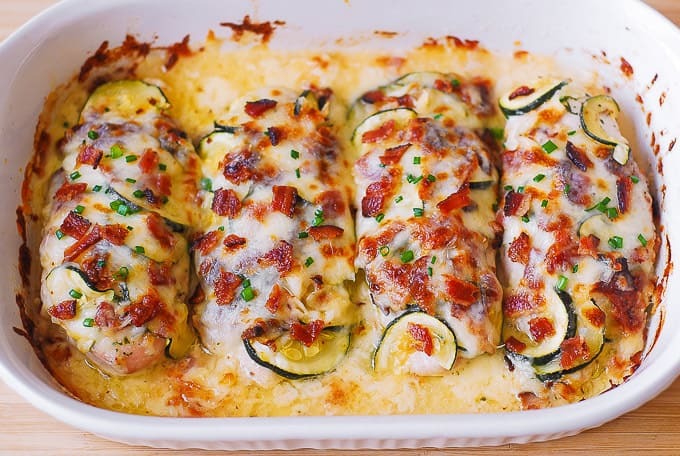 Baked chicken and zucchini is a KETO friendly meal. Want more delicious low-carb chicken bakes? Try this cream cheese chicken or buffalo chicken bake. Everything is baked in a casserole dish. The clean up is minimal! One pan to clean. It’s a great recipe if you want to add veggies to your dinner in a delicious way. 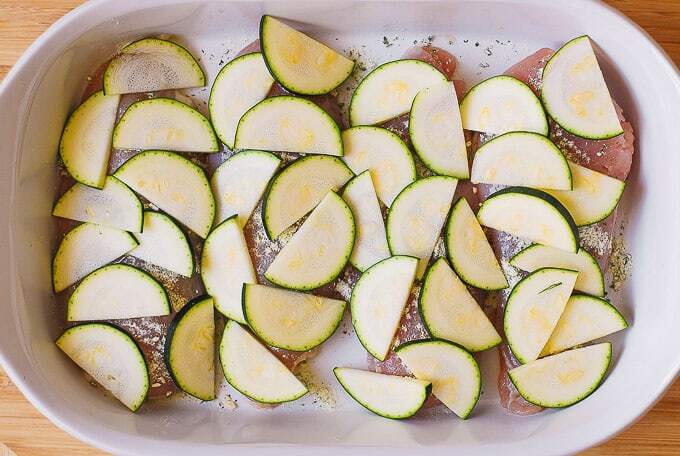 Baked chicken with zucchini is a low-carb, gluten-free recipe, packed with protein! Because there is so much protein in this recipe, it will keep you full and satisfied for a long time! Miss carbs? Pair this chicken zucchini with easy-to-make four cheese pasta (use store-bought cheese mix) or mushroom pasta. The flavors are amazing! Zucchini, crispy bacon, Mozzarella, and Parmesan. All that on top of chicken breasts seasoned with Ranch mix! Everyone in your family will love this recipe! After all, it has bacon! 1) Heat oven to 375 F.
2) Add 4 chicken breasts to casserole dish. 3) Sprinkle the chicken with dry Ranch seasoning. 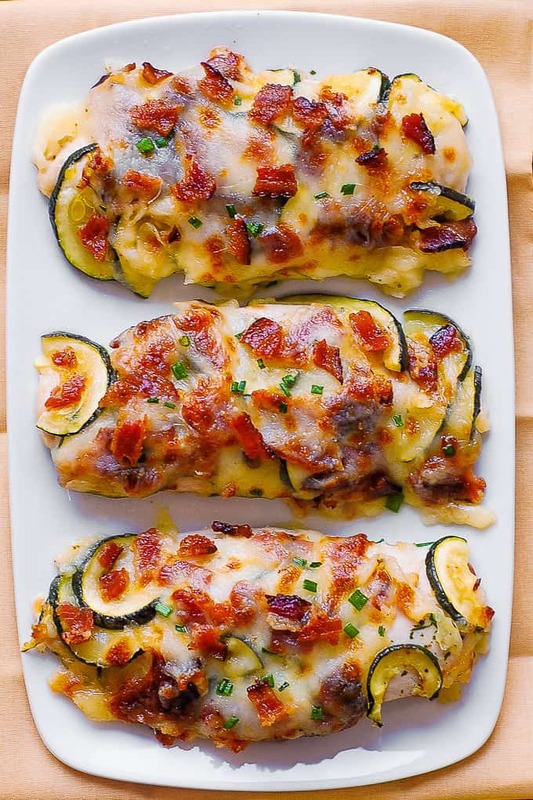 4) Top with sliced zucchini. 5) Top with chopped cooked bacon. 6) Top with shredded Parmesan and Mozzarella cheeses. 7) Bake uncovered for about 20 minutes. 8) Broil for the last 2-3 minutes (optional). 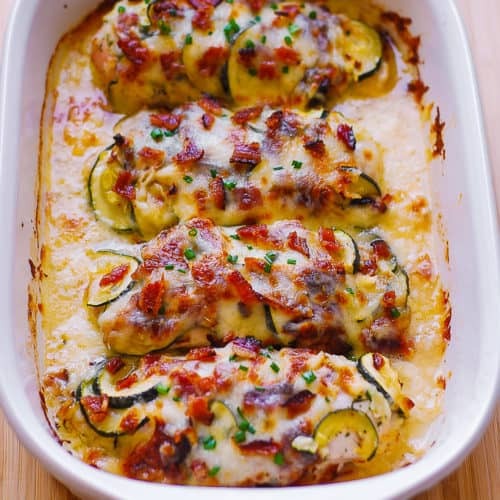 10) Allow the chicken zucchini rest in the casserole dish for 5-10 minutes. It will continue cooking as it rests. 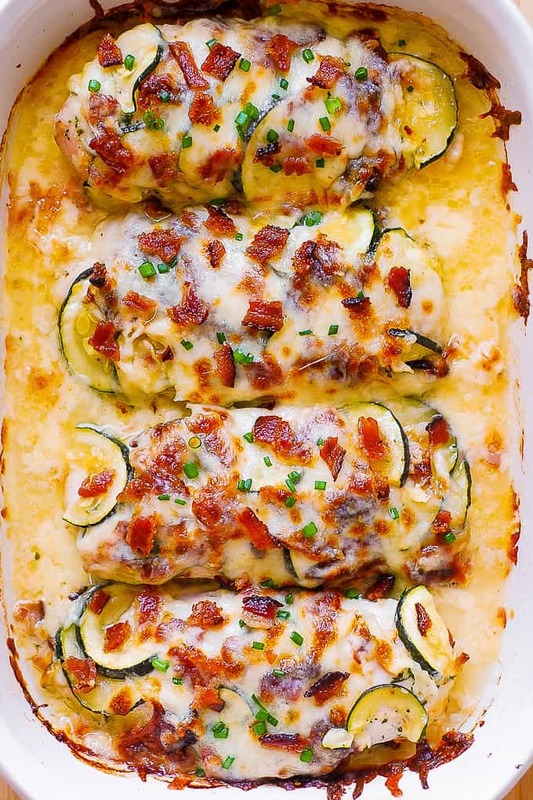 One-pan Chicken Zucchini Bake with Bacon smothered with Mozzarella and Parmesan cheeses! Your family will love this low carb dinner packed with protein and veggies! It takes only 30 minutes to make! This quick and easy family-friendly meal is gluten-free and KETO friendly. Everything is baked in a casserole dish! Add 4 chicken breasts to casserole dish. Sprinkle the chicken with dry Ranch seasoning mix. 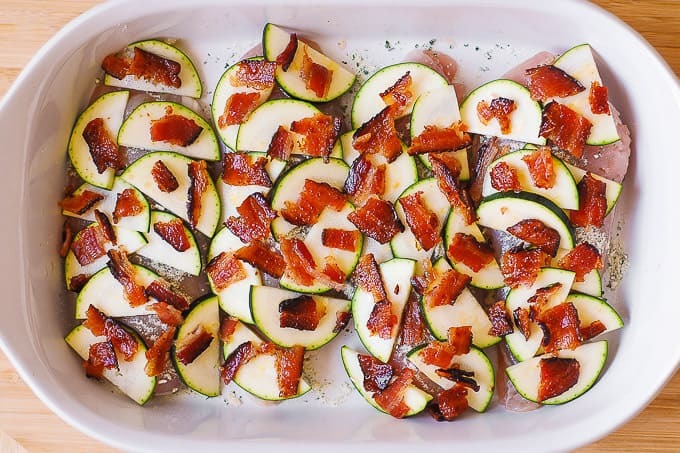 Top with sliced zucchini and chopped cooked bacon. Top with shredded Parmesan and Mozzarella cheeses. Bake uncovered for about 20 minutes. Broil for the last 2-3 minutes (optional). Allow the chicken rest in the casserole dish. It will continue cooking as it rests for 5-10 minutes. Use regular chicken breasts or thinly sliced chicken breasts. 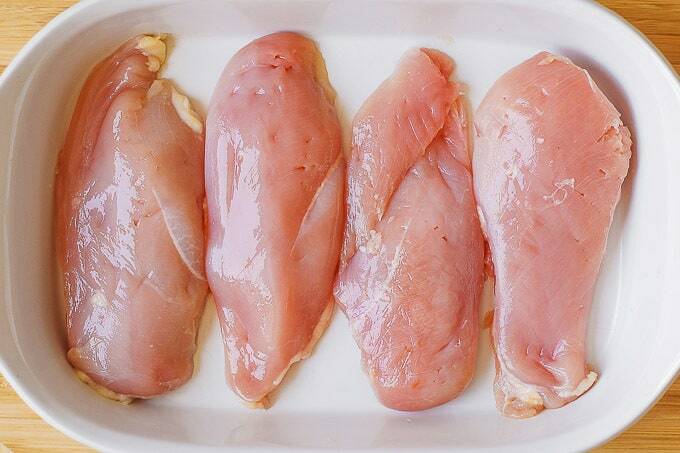 If your chicken breasts are large, slice each one in half horizontally. 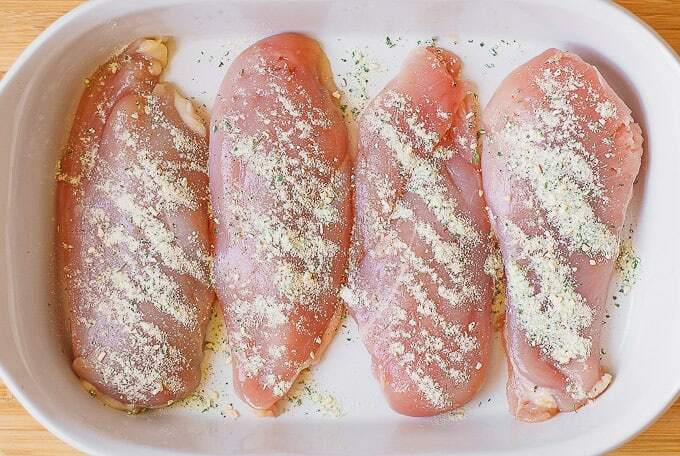 By doing this, you can make 2 thinly sliced chicken breasts out of each large chicken breast. The chicken should be cooked through in about 20 minutes. The actual time depends on your oven. All ovens are different. It also depends on the thickness of your chicken breasts. Thin chicken breasts will cook faster. The chicken is cooked through when it's no longer pink in the center. When broiling, check often. Make sure the cheese doesn't burn too much on top of the chicken. This was a great recipe! Super easy and delicious! Will make again for sure! This is a great recipe!! Thank you for posting it!